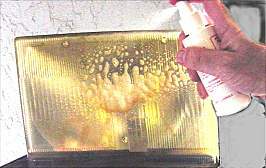 Kleen Lite® Automotive Products, The headlight restorer, Restores yellow , cloudy lens to New! MAINTAIN YOUR LIGHTS BY USING KLEEN LITE® AND BE SAFE! INSTANTLY REMOVES DIRT, GRIME, AND YELLOWING STAINS CAUSED BY ACCUMULATED EXPOSURE TO ULTRA VIOLET LIGHT AND DISSOLVES RIGHT BEFORE YOUR EYES! "Sold to the Trade Only"
HEAD LIGHTS, TAIL LIGHTS, CONVERTIBLE BACK WINDOWS, JEEP CURTAINS, BOAT CURTAINS, BOAT WINDSHIELDS, EMERGENCY LIGHTS, RUNNING LIGHTS, MOTORCYCLES FRONT SHIELDS, BUG SHIELDS, HEAD LIGHTS COVERS, TAIL LIGHT COVERS, OUT DOOR LIGHTING, ETC. A NEW QUICK AND SIMPLE TREATMENT THAT YOU CAN TRANSFORM PLASTIC AND GLASS HEADLIGHTS AND TAILLIGHTS INTO BRIGHT CLEAR UNITS. RESULTS; BETTER NIGHT VISION FOR SAFER DRIVING, ADDED UV PROTECTION FOR THE LENS, AND THE PREVENTION OF FUTURE DAMAGE WHEN USED ON NEW SURFACES. INSTANTLY …DIRT, GRIME, AND YELLOWING STAINS CAUSED BY ACCUMULATED EXPOSURE TO ULTRA VIOLET LIGHT DISSOLVES RIGHT BEFORE YOUR EYES. AND THE COST IS SURPRISINGLY LOW. 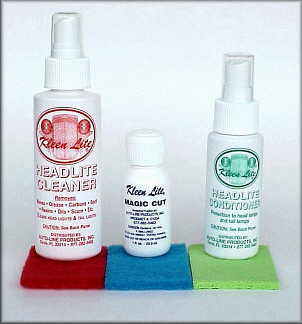 BEST OF ALL, THERE'S NO SILICONE IN KLEEN LITE®. THIS MEANS THAT IT WILL NOT DAMAGE PAINT, PLASTIC, OR CHROME SURFACES. IF YOU MISS A SPOT, YOU CAN FIX IT INSTANTLY UNLIKE OTHER PRODUCTS. 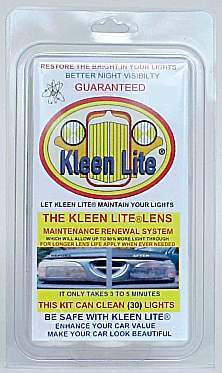 ONCE YOU SEE FOR YOUR SELF HOW BEAUTIFULLY AND QUICKLY IT WORKS, YOU'LL WANT TO RENEW AND PROTECT YOUR HEADLIGHTS, TAILLIGHTS AND OTHER PLASTIC AND GLASS PRODUCTS WITH KLEEN LITE®. IT IS ALSO EXCELLENT FOR USE ON AIRPLANES, BOATS, MOTORCYCLES, EMERGENCY LIGHTS, CONVERTIBLE BACK WINDOWS, AND LOTS MORE. IN MINUTES, THIS SILICONE FREE, PAINT FRIENDLY AND ENVIRONMENTALLY SAFE PRODUCT THOROUGHLY REMOVES YELLOWING, STAINS AND ROAD DIRT. IT MAKES TRUCKS’ AND CARS HEADLIGHTS SPARKLING CLEAN FOR IMPROVED NIGHT VISION AND ENHANCED RESALE VALUE. IDEAL FOR ANY PLASTIC OR GLASS PRODUCTS.